Be the first to share your favorite memory, photo or story of Archie. This memorial page is dedicated for family, friends and future generations to celebrate the life of their loved one. Mr. Archie Boyd Johnson, Jr., 78, of Dunn went to Heaven on Monday, August 27, 2018. Archie was born in Conway, South Carolina on November 26, 1939 son of the late Archie and Jamima Hodges Johnson. He was preceded in death by his sister, Flossie Chestnutt. 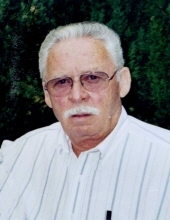 Archie was a sales representative with Lafayette Roofing in Fayetteville for many years and employed with Diversified Wood Products of Dunn for many years. A memorial service will be held at 7 p.m. Thursday, August 30, 2018 at Skinner & Smith Funeral Home Chapel with Pastor Tom Wagoner officiating. Archie is survived by his wife, Linda B. Johnson; son, Chris Johnson (Susan) of Longs, South Carolina; stepsons, Glenn Barefoot of Dunn, Brian Barefoot (Kelsey) of Dunn; step daughter, Sharon Hudson (Mike) of Dunn; sister, Edith Wilson of Columbia, South Carolina; grandchildren, Christopher Johnson, Benny Johnson, Jonathan Barefoot, Justin Barefoot, Glenna Barefoot and Canon Barefoot; great-grandchildren, Olivia Johnson, Madison Barefoot, Gavin Barefoot and Grant Barefoot and several nieces also survive. The family will receive friends 6-7 p.m. Thursday one hour prior to the service at the funeral home. The family expresses a heartfelt thank you to Liberty Home Care and Hospice. To send flowers or a remembrance gift to the family of Archie Boyd Johnson, please visit our Tribute Store. "Email Address" would like to share the life celebration of Archie Boyd Johnson. Click on the "link" to go to share a favorite memory or leave a condolence message for the family.